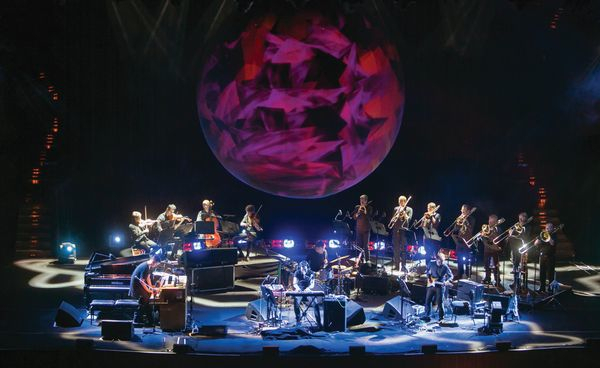 Make your plans now for "Planetarium," the U.S. premiere by Bryce Dessner, Nico Muhly and Sufjan Stevens, at the Brooklyn Academy of Music (BAM) March 21 through 24. Dessner is best known as the guitarist of The National, as well as the curator the new indiefest Crossing Brooklyn Ferry, which will return to BAM April 25 through 27. Muhly is a prolific composer of operas, choral and orchestral pieces, as well as film scores (including 2008 Oscar Best Picture nominee The Reader). He recently created music for the new production of Tennessee Williams' The Glass Menagerie, garnering rave reviews up in Cambridge, Massachusetts. Stevens has composed albums full of indie folk before recently embracing electronica for music on his label, Asthmatic Kitty Records. Together the three friends found a project where they could contribute equally -- no phoning it in by emailing each other files. I recently wrote an article about the piece for the BAMbill program, and I interviewed both Muhly and Dessner. I didn't realize how much the composers had worked on each other's projects over the years, from Muhly's orchestrations to Stevens' stage appearances and Dessner's guitar in recordings. They also all have strong ties to BAM and that was the first place they thought of for this U.S. premiere. The first half of the performance features pieces by each contributor: Muhly's "Diacritical Marks 1 - 8," Stevens' "Enjoy Your Rabbit" arranged for strings, and a string quartet by Dessner. "Planetarium" brings the collaborators on stage for the second half with the string quartet, a drummer and trombone section. Stevens' fragile tenor hovers over the instruments, reflecting about the heavens as a 16-foot orb receives film projections by visual artist Deborah Johnson. Check out the performance video below or on YouTube here, and for further information about tickets visit bam.org. Beck Reimagines Bowie's "Sound and Vision"
Beach House Post Short Film, "Forever Still"